$49.95 In stock - low quantity. Order in the next 7 hours, 43 minutes and it will go out today! In stock - low quantity. Order in the next 7 hours, 43 minutes and it will go out today! Magicians have been making their props elongate, stretch and magically get longer for years. But suppose you could do that with your necktie? This is a very funny gag that you can perform in a style that suits your character. You can make it stretch quickly or very slowly. Check out the video! Danny Orleans, of AmazeKids is a fan of making small, gradual stretches during your show so it's barely noticeable! Another approach is to combine it with Cut and Restored Rope or Professor's Nightmare. 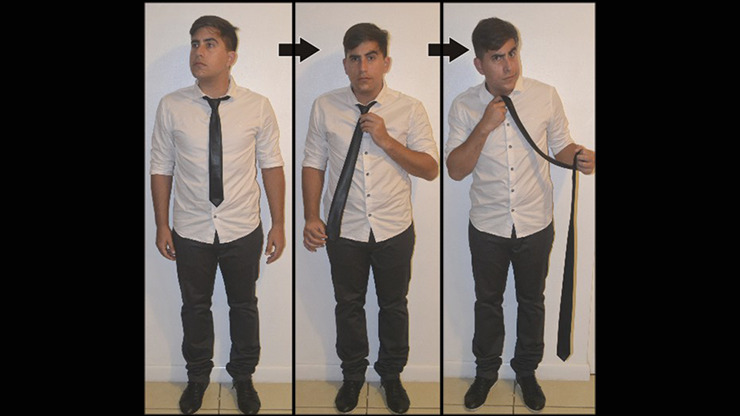 Not only can you make the rope lengthen, but your tie does too! Yes, it comes in different colors. Choose your color: red, blue or black as you check out. If you're looking for a strong visual gag that will make the kids scream (especially if they "see it" before you do), consider the Comedy Necktie by Nahuel Olivera. It's great for emcees, clowns and hip magicians that like to wear a contemporary-looking tie. It is easy to handle and creates a very visual, surprising moment of magic.